Organic Sales: More than 50% of total store sales are organic. Produce sales are 100% organic. Living Earth's board member Frank Phelan is the store's GMO expert. He identifies and eventually removes all GMO products from the store. Along with regularly removing suspect products from store shelves, Frank has persuaded several companies to substitute suspect ingredients for GMO-free and organic ingredients. Getting manufacturers to remove soy lecithin and canola oil has been the biggest challenge. 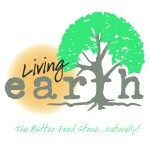 Living Earth does not label GMO or non-GMO foods. Hi. Do you have any plans on opening a store or two on Cape Cod? Maybe you will put this on your ‘to do’ list. Thanks.